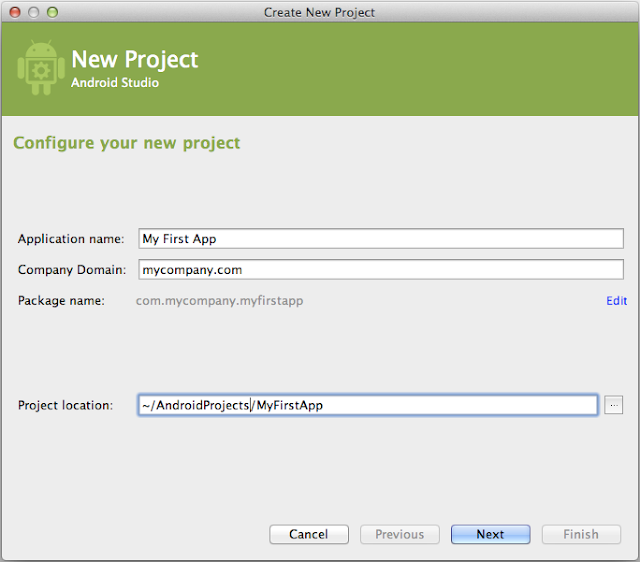 Configuring a new project in Android Studio. Under Configure your new project, fill in the fields as shown above and click Next. It will probably be easier to follow these lessons if you use the same values as shown. Under Add an activity to <template>, select Blank Activity and click Next., select Blank Activity and click Next. Under Choose options for your new file, change the Activity Name to MyActivity. The Layout Name changes to activity_my, and the Title to MyActivity. The Menu Resource Name is menu_my. An activity is one of the distinguishing features of the Android framework. Activities provide the user with access to your app, and there may be many activities. An application will usually have a main activity for when the user launches the application, another activity for when she selects some content to view, for example, and other activities for when she performs other tasks within the app. This is the XML layout file for the activity you added when you created the project with Android Studio. Following the New Project workflow, Android Studio presents this file with both a text view and a preview of the screen UI. The file includes some default settings and a TextView element that displays the message, "Hello world!" A tab for this file appears in Android Studio when the New Project workflow finishes. When you select the file you see the class definition for the activity you created. When you build and run the app, the Activity class starts the activity and loads the layout file that says "Hello World!" compiledSdkVersion is the platform version against which you will compile your app. By default, this is set to the latest version of Android available in your SDK. (It should be Android 4.1 or greater; if you don't have such a version available, you must install one using the SDK Manager.) You can still build your app to support older versions, but setting this to the latest version allows you to enable new features and optimize your app for a great user experience on the latest devices. applicationId is the fully qualified package name for your application that you specified during the New Project workflow. minSdkVersion is the Minimum SDK version you specified during the New Project workflow. This is the earliest version of the Android SDK that your app supports. targetSdkVersion indicates the highest version of Android with which you have tested your application. As new versions of Android become available, you should test your app on the new version and update this value to match the latest API level and thereby take advantage of new platform features. For more information, read Supporting Different Platform Versions. See Building Your Project with Gradle for more information about Gradle. Directories for drawable objects (such as bitmaps) that are designed for various densities, such as medium-density (mdpi) and high-density (hdpi) screens. Other drawable directories contain assets designed for other screen densities. Here you'll find the ic_launcher.png that appears when you run the default app. Directory for files that define your app's user interface like activity_my.xml, discussed above, which describes a basic layout for the MyActivity class. Directory for files that define your app's menu items.